In the late 60s and early 70s in Brazil, a series of works on unsustainable practices and conceptual art strategies with political activism. It was not representation of revolutionary processes of images of guerrillas or works weakened or of strengthening like Hercules by the revolutionary process. On the contrary, and above all, it was a matter of questioning an art project as representation, which is the foundation of capital and its bourgeoisie. A structural isomorphism is sought between the revolutionary process of guerrilla warfare and artistic practices and languages. That is, how to make a revolutionary-guerrilla process in the aesthetic, cultural and artistic universe, respecting its autonomy and in its own terms? This is exactly the case of a series of works by Cildo Meireles called “Insertions in ideological circuits”. The job was in the system of circuits and exchange information. As series of insertions in information by a variety of alternative circuits exemplified by Coca-Cola bottles, Black-Power hair combs, money notes, etc. The historical context in which the work circulates and gives it meaning is Brazil dominated by a military dictatorship that violated the constitutional regime of 1964 and rebounded upon the late 60s. The dictatorial regime, Immediately, Imposed a dramatic repression on the artistic expressions, subjecting them to a censorship that filtered all forms of information. 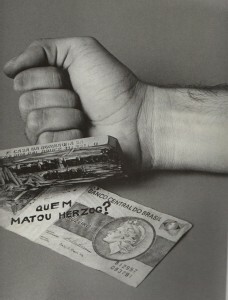 The series of insertions in ideological circuits of Cildo Meireles sought to explore communication and artistic alternatives to execute a true guerrilla against the repressive system of the military dictatorship. Among the series, it is worth mentioning the information printed on Coca-Cola bottles. 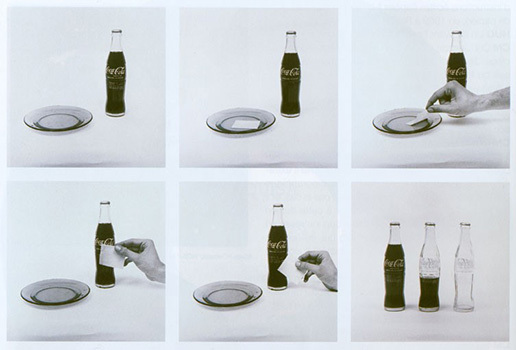 This conceptual work was a project that used a media, bottle of soda, to carry out a revolutionary criticism by means of anti-imperialist messages to a potentially immense public and, at the same time, escaped from the vigilant monitoring carried out by the dictatorship in all conventional channels of communication. The insertion of the Coca-Cola type consisted in printing messages and critical opinions about Brazilian politics, about U.S. imperialism and interventionism. These messages were printed in white, which made them almost invisible (hidden) when the bottles were empty. As soon as they were filled with the syrup, the messages became clearly visible. We remember that in the time in question, late 60’s and early 70’s, soft drinks were sold only in bottles , requiring the exchange of the empty hull (bottle) in the purchase of a full. The informational circuit becomes perfect, then. In the very sign of imperialism itself, revolutionary and critical messages are conveyed. The work consists not only in the messages of Cildo Meireles, but also in an invitation for all to make and exchange these critical messages. It is an invitation to a certain action, which in terms of conceptual art became known as command-piece. What is important to this work of art is the projected idea and the process that it triggers. Everyone becomes an artist. This was the great utopia of Joseph Beuys and much of modernism, being fundamental question lines of conceptual art. It is important to note that the work of Cildo Meireles is a reverse or reversed Duchamp. The Duchampian ready-mades were discrete everyday objects inserted into the circuit of art, functioning as unveiling of the political system of art and a complete desublimation of the same. Art is undone in everyday life, losing all its goldenness. The poetry of ready-made was appropriated by Pop Art and Minimalism by largely mitigating its critical power. Already the Insertions of Cildo Meireles are the art and its transforming power of reality. It inserts itself into everyday life as art that is idea, trying to transform the same everyday. All the force of an intentionality (of the artist) rescues the romantic power of belief in art as a possibility of regeneration and return to a life in social harmony and with nature. 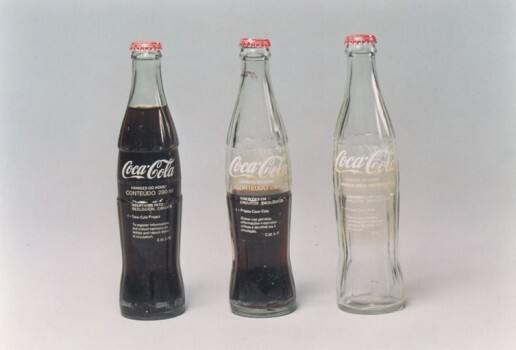 Instead of inserting a common object of the institutional space of art, as Duchamp does, the work of Cildo Meireles returns the Coca-Cola bottles of its original circulation system, albeit with its slightly altered form. Art does not dissolve in life, but it dialogues with it, criticizes it and seeks to transform it, functioning as a negative of the current situation. The insertions of Cildo Meireles return the discussion about the relations between art and life (reality), going beyond representational conceptions or teleologies that simply dilute art in life. This entry was posted in Aesthetical, Art, Communication, Ethical, Poetical and tagged Art and Politics, Cildo Meireles, conceptual art, Philosophy of Art by Eduardo Cardoso Braga. Bookmark the permalink.